This is matted in a white mat and looks great! 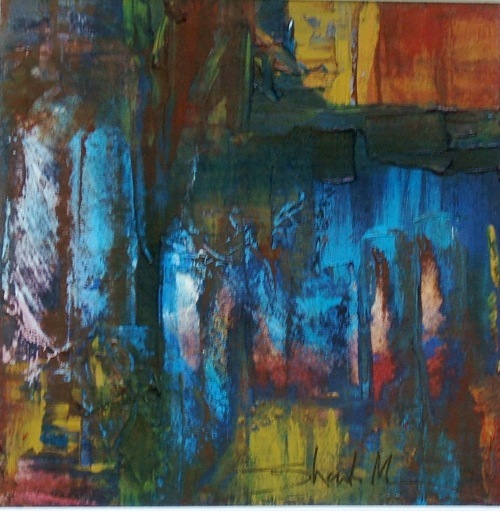 This little painting is an abstract and is part of the ancient ritual series. This series if you don’t know and aren’t a regular visitor, is basically about how we mark the passing of time and the events in our lives with ritual. I thought I was finished with this series but every now and then another one just appears on my easel. Like magic. I had a wonderful day today, it started out with me getting up at the crack of dawn to go into Charlotte NC for a life drawing session. The session went very well and I hung around the gallery talking to the host thinking that perhaps a customer may come in to view and possibly buy one of my larger works. That didn’t materialized. Just down the street from the Art league is a small farmer’s market so I walked down there and wouldn’t you know it, a sudden squall came up and luckily they had tents, so I walked thru the tables of flowers and cakes, vegetables and of course fruit. I bought some organic lettuce and some other vegetables, talked a bit, the usual “wow isn’t this weather crazy?” and just like always the storm blew over almost as fast as it came in and it was only sprinkling as I walked back to my car.